Last year when we HelpX’d in Scotland we managed to do a bit of exploring on the west coast and wanted to do the same during this stay. 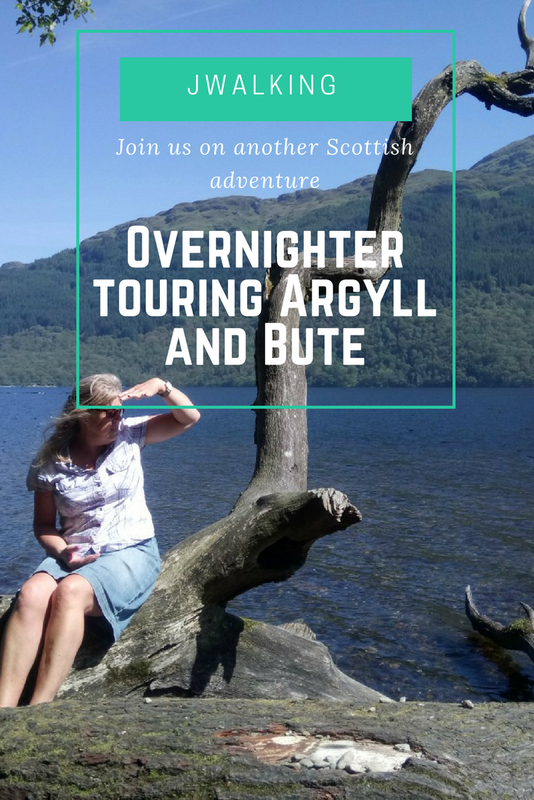 Ideally we would like to get across to the western isles but an overnight stay just wouldn’t touch the surface of what there is to see and needs a longer dedicated stay/trip all of it’s own. So for our first jaunt we decided to head towards Oban, Gateway to the Hebridean Isles. Our route took us along the northern edge of Loch Tay. An early start meant that the water was very still and the reflection of the surrounding hills on the water were like a mirror. We had been to the pretty town of Killin at the western end of the Loch before, so admired the lively Falls of Dochart as we crossed the stone bridge to continue our journey. The scenery was lovely and it felt like no time at all before we were approaching the first stop off that we had planned, Connel Bridge. The bridge spans Loch Etive at it’s narrowest point and was originally built in 1903 just for trains. Since 1966 the line has been closed and it has been converted to a single track road bridge. It is an impressive landmark but the area is more renowned for the falls that flow under it. When the tide level falls below the level of water in Loch Etive the seawater in the Loch rushes through the narrow gap under the bridge and causes rapids that are used by kayakers, surfers and divers. If you want to see this you have to time your visit by the tides which we, unfortunately, didn’t do. We usually plan the detail of our trips but this one eluded us and we only saw little white ripples. Maybe a return visit is needed to see what this downloaded (shame on me) photo shows. Next stop off was this castle. 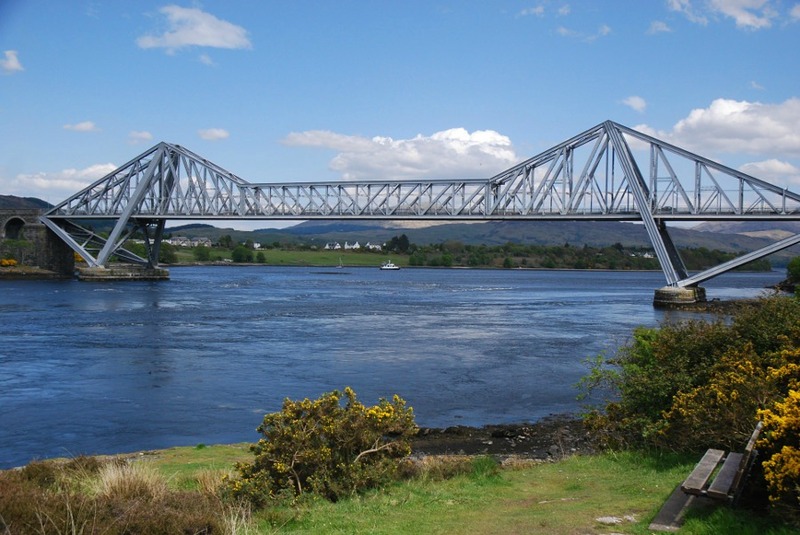 Only 3 miles from Oban it sits at the entrance to Loch Etive and the Connel Bridge is within sight. Built around 1240 it is mostly a ruin but in great condition considering it’s age. It is surrounded by the sea on three sides. 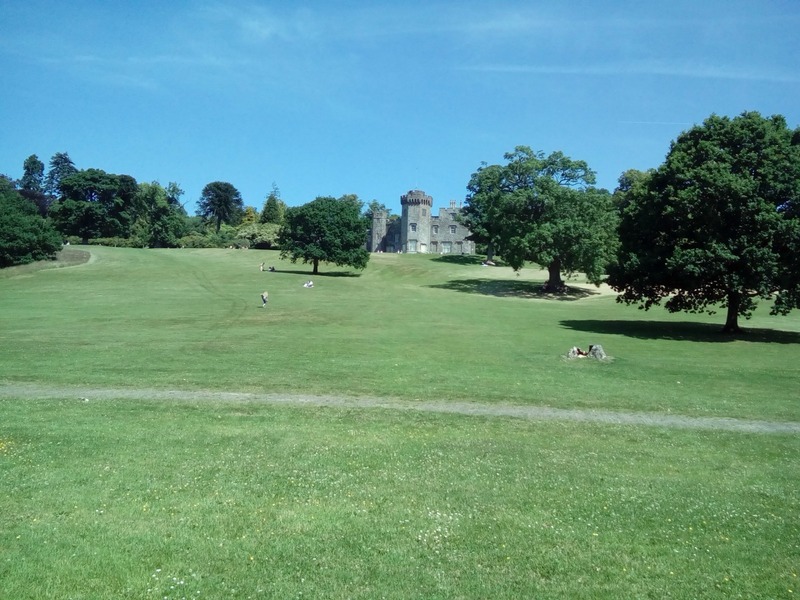 I love it when our trips link up and we didn’t know until we arrived that it is recorded (although debated) that the Stone of Destiny was kept here after being brought from Ireland (Scone Palace and the Stone of Destiny). 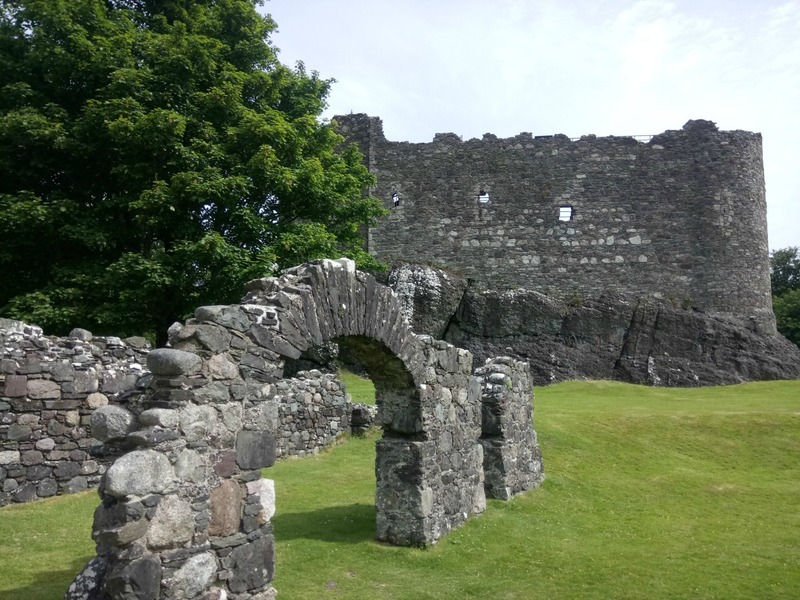 You know how I love a bit of history, so I was also interested to read that Flora MacDonald was held at Dunstaffnage in 1746 before being sent to the Tower of London for helping Bonnie Prince Charlie escape government troops. I haven’t researched it but it makes sense that this is why the Falls under Connel Bridge are called Flora Falls. 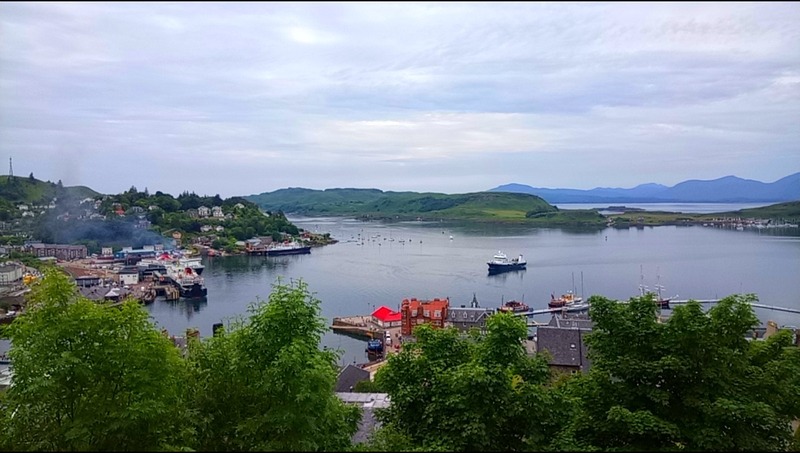 Oban is a town sitting on a near perfect horseshoe shaped bay and has a busy harbour. 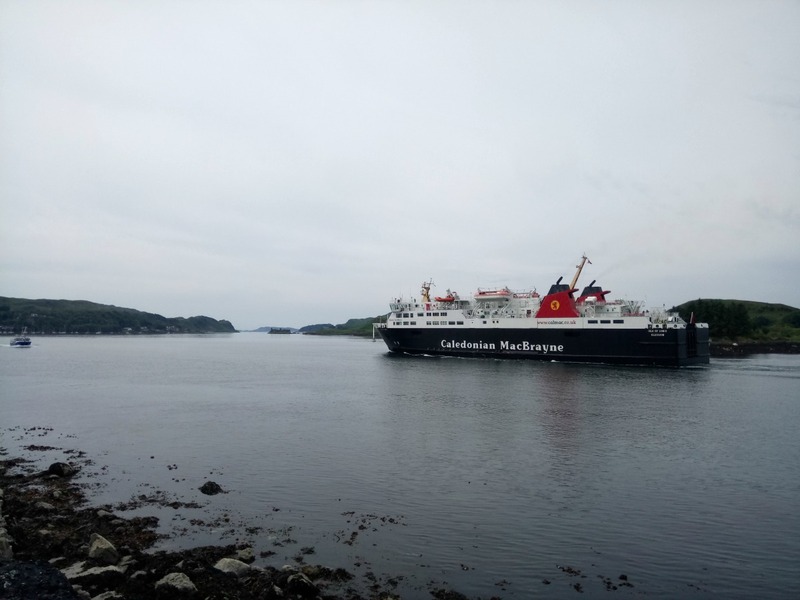 It is the busiest terminal to the isles for the main ferry company, Caledonian Macbrayne. We found a quiet spot facing the sea to eat our picnic and watch the ferries and yachts coming and going. We had good views of the isles of Kerrera and further out Mull. 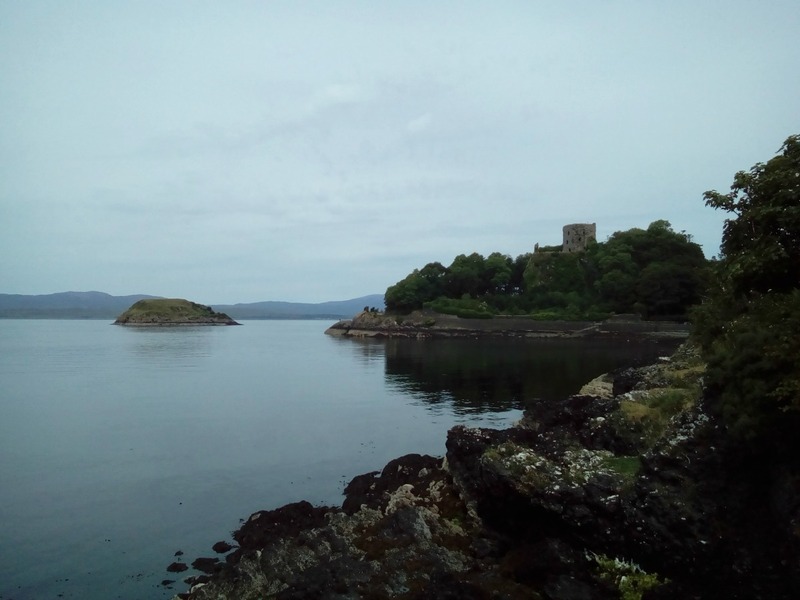 We strolled further along to see Dunollie Castle which sits high on the headland overlooking the bay. 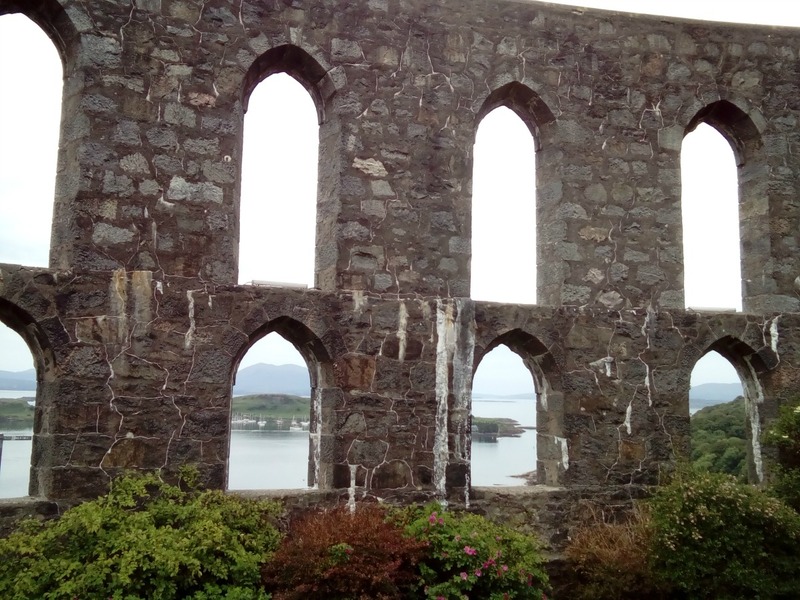 It is open to the public and has a museum but after admiring the view, we headed back to Oban to do some more exploring. 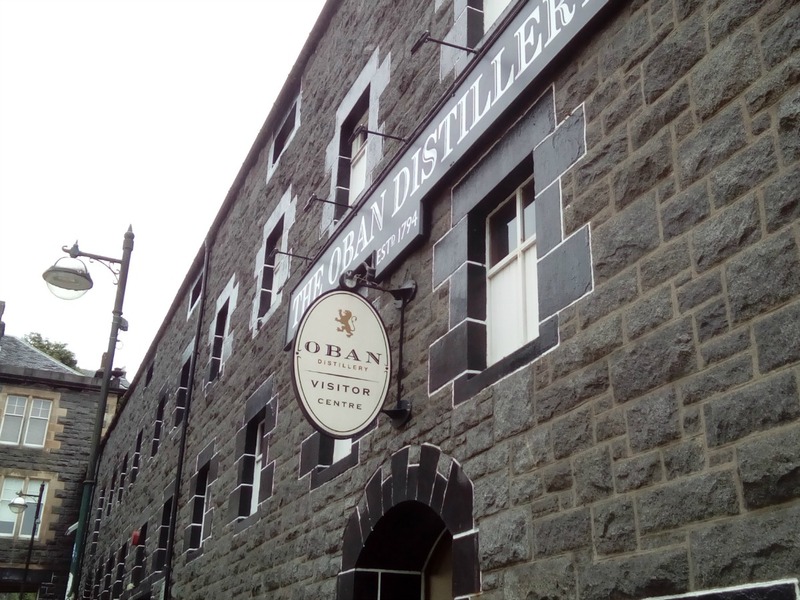 It is at this point that I should point out that this is Jon’s second visit to Oban. His first visit was when he was 11 years old with his family on an ill fated camping trip. They drove up from Kent in their small family car loaded with camping equipment and camped outside the town. I say ill fated because it was the year the tent leaked like a sieve. His younger brother, David, had a bottle of bubbles and merrily blew them both inside and outside the tent. It wasn’t till the next regular downpour that they realised it had affected the waterproofing of the canvas and the rain literally poured through. Happy family camping holidays! We found a little museum which gave us a lot of information on the town’s history. There was quite a military angle to the museum and lots of information on Oban being an important base for the Battle of the Atlantic for both merchant and Royal Navy ships in WWII. The town was very busy but we walked around the harbour, town and did some people watching. 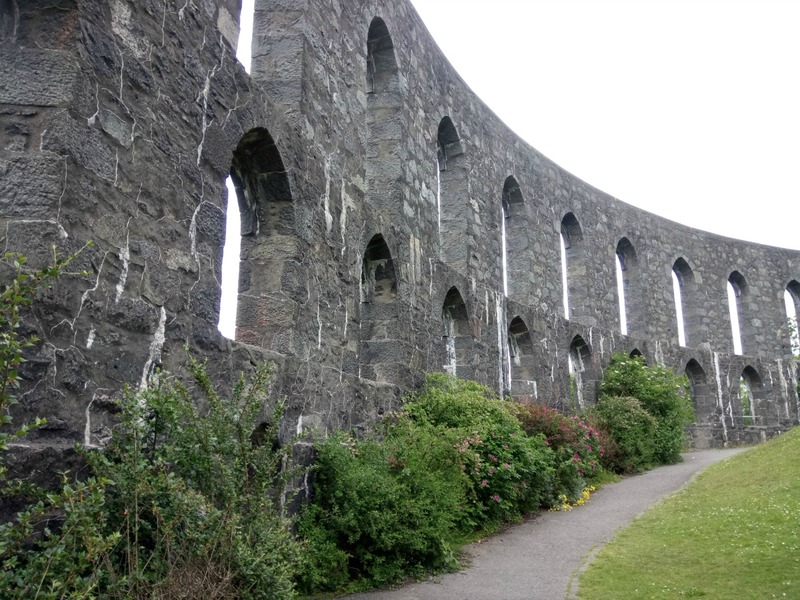 Dominating the skyline above Oban is the Colosseum style structure, McCaig’s Tower. 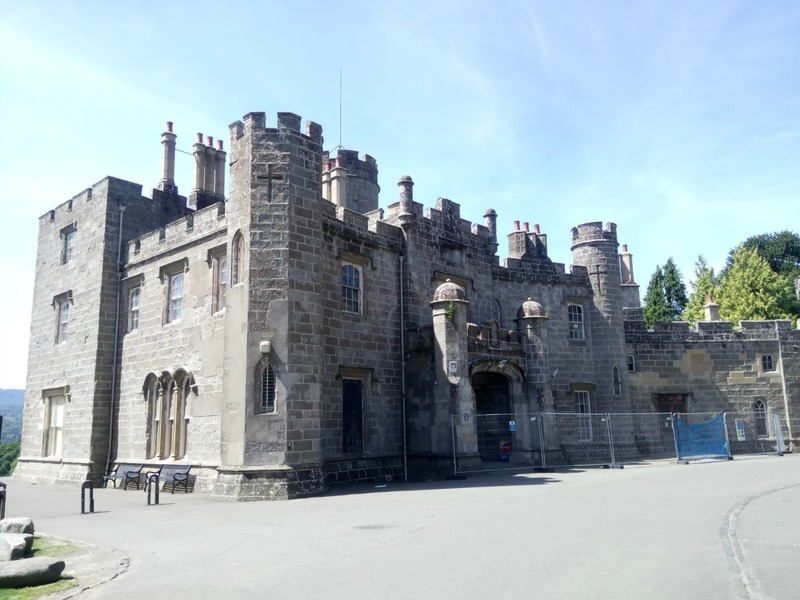 It was built supposedly to provide work to local masons and as a monument to John McCaig’s family. He died before it was completed and it has remained this way ever since. 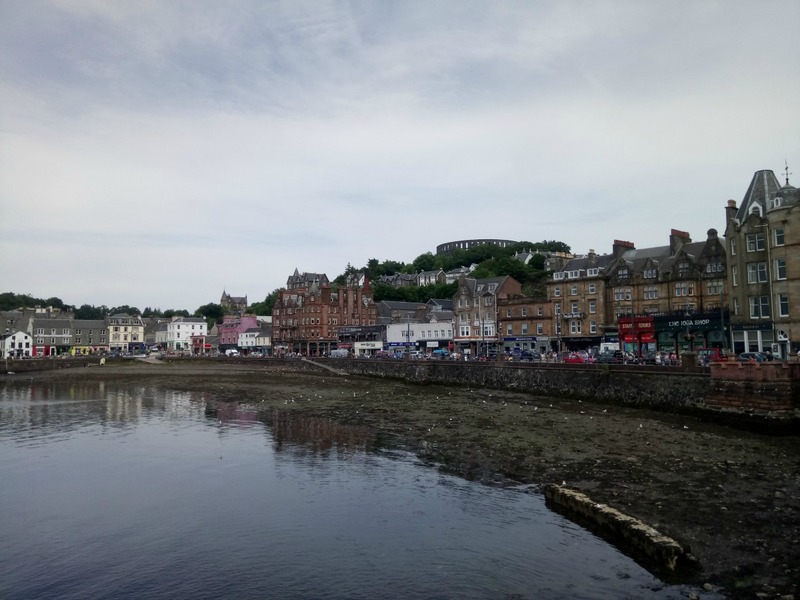 Although this post seems to be getting longer and longer, I can’t leave this Oban section without mentioning that Oban has a Guy Fawkes firework display every November. The 2011 one was particularly memorable as, due to a computer error, the thousands of pounds worth of fireworks for the 20-30 minute display went up in less than a minute. Ooops. 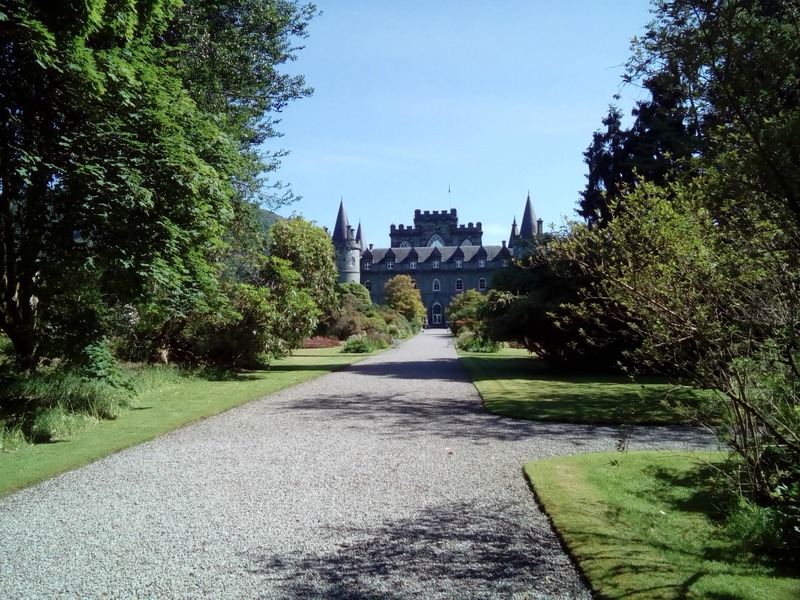 Our overnight stay was in Furnace near Inveraray. We intentionally went the long way! 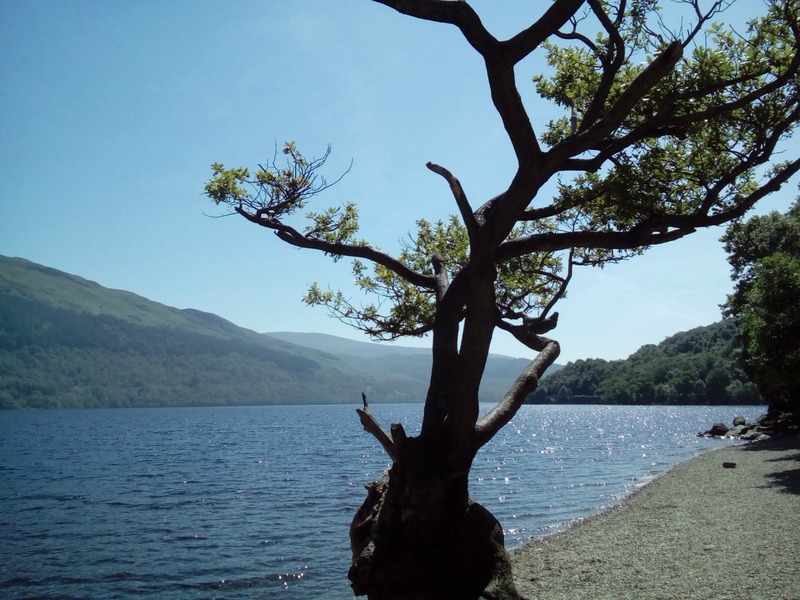 We had a great drive through the Glen of Kilmartin then a 23 mile drive up a single track road along the side of Loch Awe, the longest freshwater lake in Scotland. 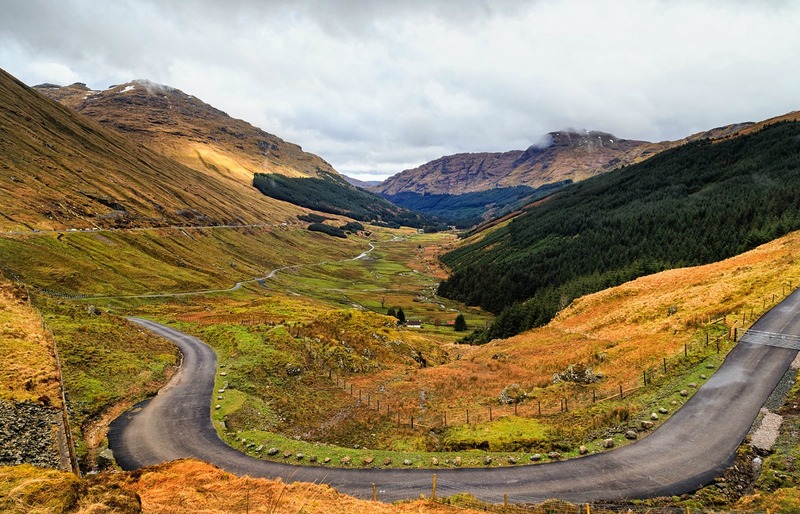 Encapsulating everything the Highlands is about. 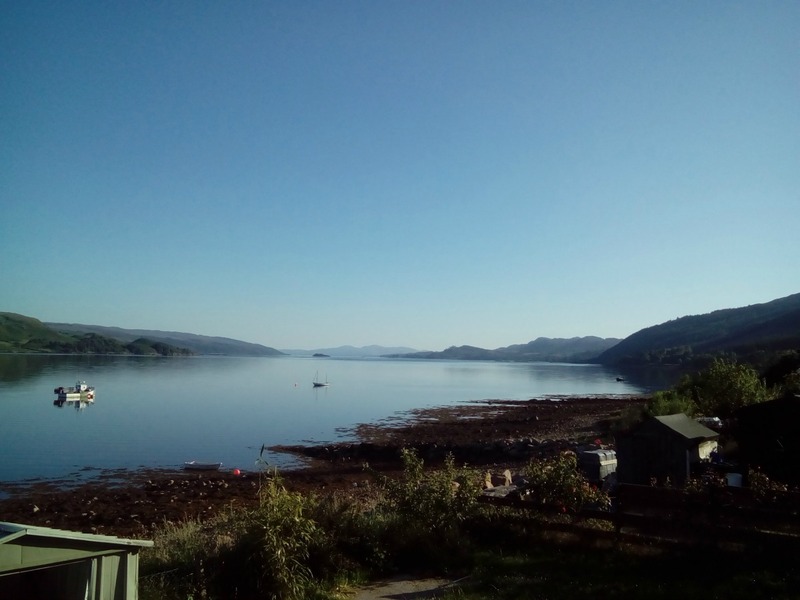 Our No 15 B&B booking looked like a terraced house from the front but the garden backed onto Loch Fyne, just the place to relax after a long day. Coffee and a huge wedge of cake from the host made it even better. 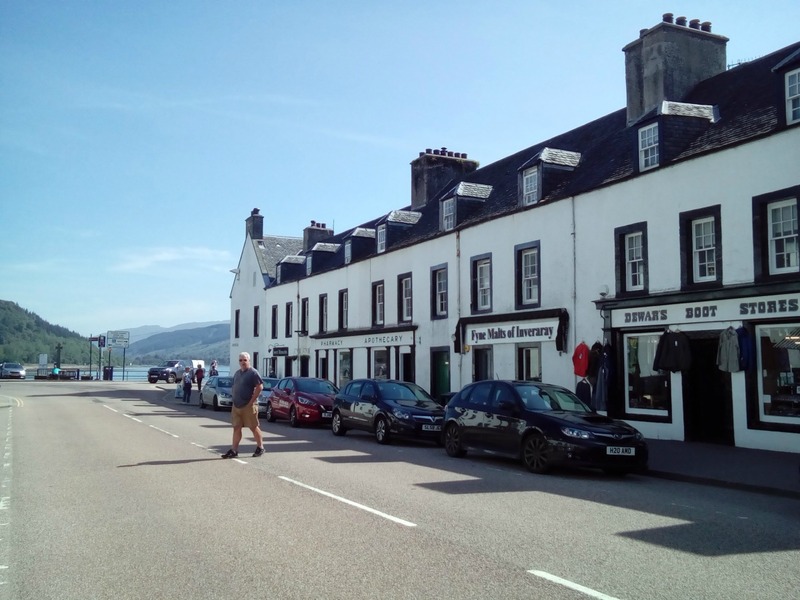 After a very heart breakfast, we had a wander around Inveraray admiring all the black and white shops signs. They only have black and white signs for some reason. We also took a drive up the castle before hitting the road towards Loch Lomond. The objective was Loch Lomond but it was in some ways surpassed by the drive through Glen Croe and the Rest and Be Thankful view point. Stunning in the continuing superb weather we had. Just a short drive further on we saw Loch Lomond for the first time and discovered part of the remaining old road which, if still in use, would be a much nicer drive than the busy A road. It would have been a great place for lunch but supplies were short so we headed onto Ballach at the southern end of the Loch. Armed with lunch supplies we took a walk around the busy town, ate our picnic by the marina then took a long walk through Balloch Castle Park. We didn’t really feel like getting back in the car but knew we should start to head homeward. 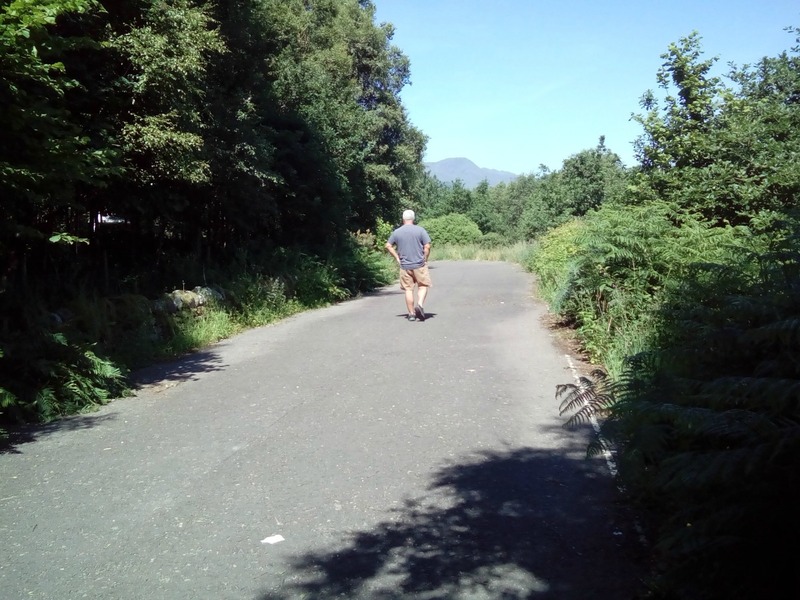 We planned our route home to go through the Trossachs National Park and skirt a few more Lochs. We weren’t disappointed. We headed north with Loch Katrine to the west and Loch Achray to the east. The road was twisty and turny and we were so pleased we chose this route. To put off getting back even more we stopped for coffee on the banks of Loch Venechar relaxing on the balcony at the front of Venechar Lochside a beautiful wooden lodge that was a restaurant, cafe and gift shop. The cakes looked amazing and I am not sure how we resisted the temptation but we did! This all sounds like an epic journey but, as usual, we did everything at our leisurely JWalking pace with not one midge or drop of rain. One thing is for sure. We need to go back! 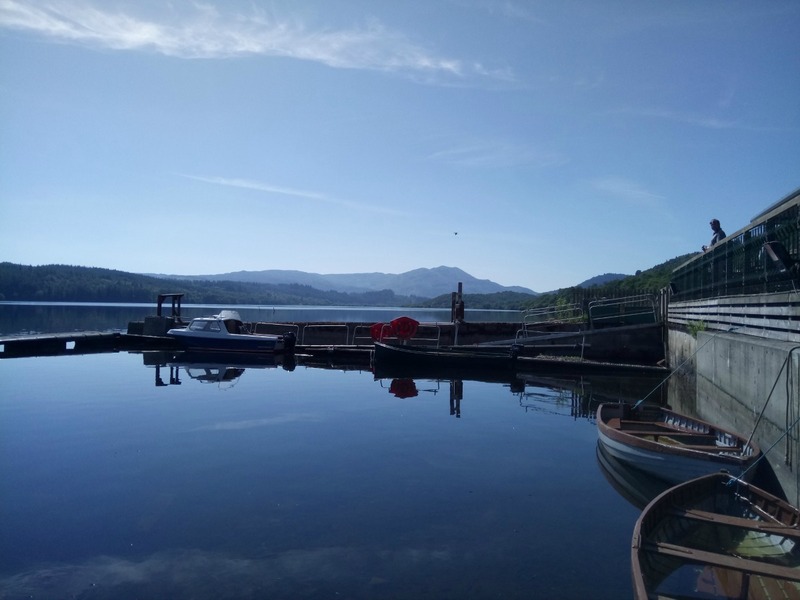 It has intensified my desire to get to the isles but we would probably give Loch Lomond a miss and keep to the quieter lochs and glens of the beautiful Argyll and Bute area. We may even take a tent but strictly no bubbles! 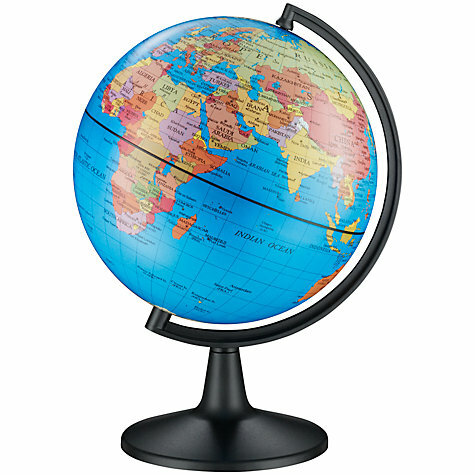 Aww your posts are making me want to visit …. have you met any midges yet? I believe June was the season? June is the season, you’re right but strangely we have not encountered any on our travels (yet!) Another mysterious absence is rain. 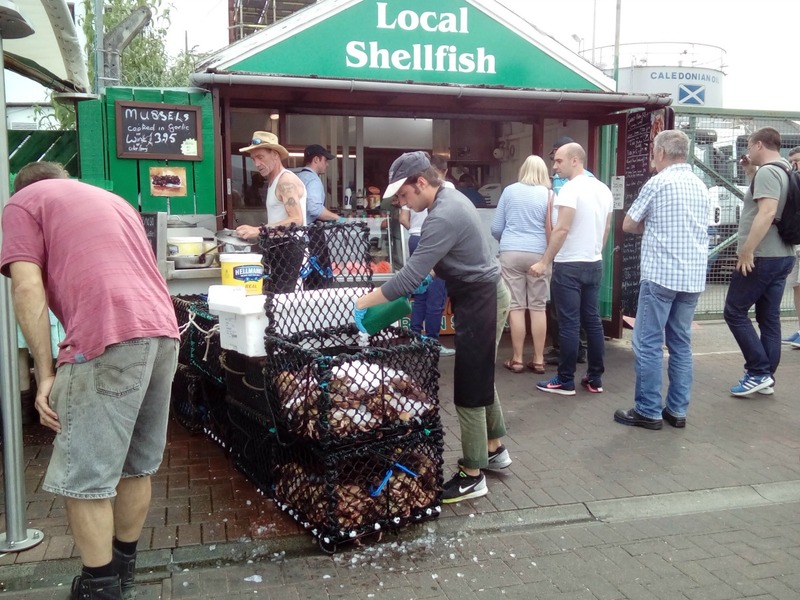 Is this really the same Scotland we read about? It’s all very odd isn’t it….. I’m sure we’ll pay for it in time! We took a trip up to Obam in 2015 – a lovely place. Also called by Loch Lomond which I don’t particularly remember. I do remember singing the Bonnie, Bonnie banks of Loch Lomond on route though. Loved that picture with the autumn colours. 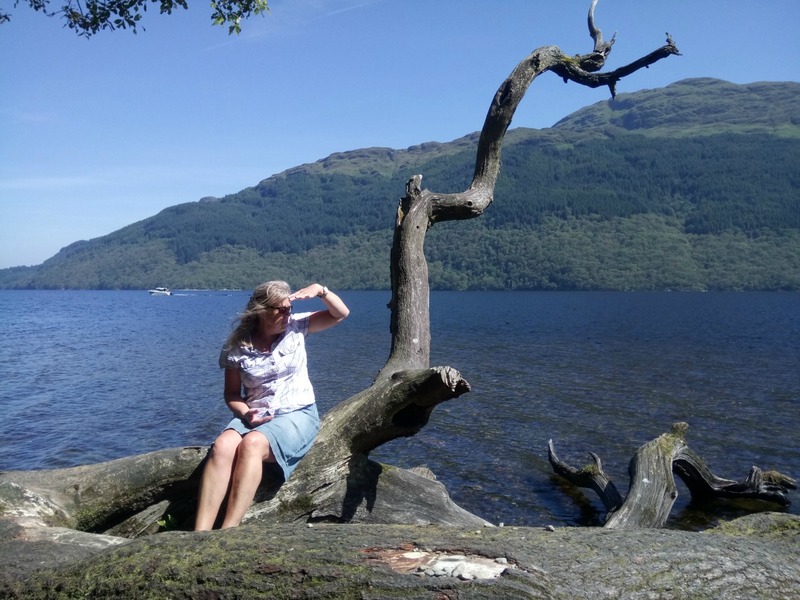 You fell into to the classic cliche of Bonnie, Bonnie Banks O’Loch Lomond! We tried so hard not to although I think I blurted out something about High Roads and Low Roads. The scenery is a bit overwhelming…..hope the photos do it a little of justice. It is an absolutely stunning area. Like you, we keep saying what we want to do when and if we come back. Let’s hope we can fulfill the many many plans. I spent many years on the Bonnie banks of Loch. Lomand, swimming in its clear waters whilst my granny looked on. Such wonderful memories! What a wonderful place to spend your youth. It was tempting to take a dip I must say. 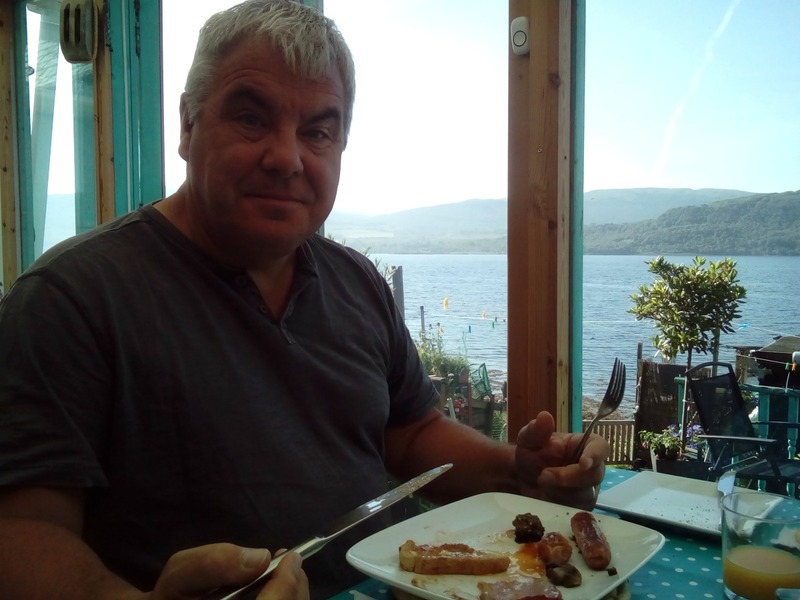 Ros, Jack and I had lunch at the Venechar Lochside 30th June last year. Didn’t have the sunshine you did but what a lovely, peaceful place it is. The cakes are awesome. You missed out there. The whole drive is a classic.